ABSTRACT: Due to the Internet revolution, human conversational data--in written forms--are accumulating at a phenomenal rate, as more and more people engage in email exchanges, blogging, texting and other social media activities. In this talk, we will present automatic methods for analyzing conversational text generated in asynchronous conversations, i.e., where participants communicate with each other at different times (e.g., email, blog, forum). Our focus will be on novel techniques to detect the topics covered in the conversation, and to identify whether an utterance in the conversation is expressing an opinion and what its polarity is. 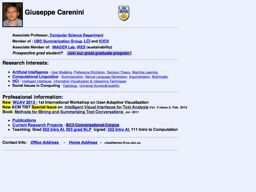 BIO: Giuseppe is an Associate Professor in Computer Science at the University of British Columbia (BC, Canada). He is also a member of the UBC Institute for Computing, Information, and Cognitive Systems (ICICS) and an Associate member of the UBC Institute for Resources, Environment and Sustainability (IRES). Giuseppe has broad interdisciplinary interests. His work on natural language processing and information visualization to support decision making has been published in over 80 peer-reviewed papers. Dr. Carenini was the area chair for “Sentiment Analysis, Opinion Mining, and Text Classification” of ACL 2009 and the area chair for “Summarization and Generation” of NAACL 2012. He has recently co-edited an ACM-TIST Special Issue on “Intelligent Visual Interfaces for Text Analysis”. In July 2011, he has published a co-authored book on “Methods for Mining and Summarizing Text Conversations”. In his work, Dr. Carenini has also extensively collaborated with industrial partners, including Microsoft and IBM. Giuseppe was awarded a Google Research Award and an IBM CASCON Best Exhibit Award in 2007 and 2010 respectively.